Visual impairment is a term used to describe any kind of vision loss that cannot be fixed with usual methods, like eyeglasses or contact lenses. It includes correctable and uncorrectable blindness, low vision, and other forms of vision loss. If left untreated, visual impairment can cause serious health problems and lead to a decreased quality of life. 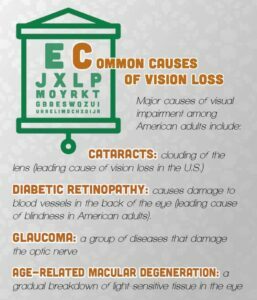 More than 3.4 million Americans ages 40+ are blind or visually impaired, with the major causes of vision loss being cataracts, age-related macular degeneration, diabetic retionopathy and glaucoma. Additionally, an estimated 61 million adults in the U.S. are at risk for serious vision loss, and only half have visited an eye doctor in the past year. People with vision loss are more likely to report depression, hearing impairment, stroke, falls, cognitive decline, and premature death. Losing sight often leads to the inability to drive, read, keep accounts and travel, thus reducing one’s quality of life. Women, minority groups, and people with a chronic disease like diabetes are at higher risk for vision impairment. Many people think vision impairment is an unavoidable part of aging, but it doesn’t have to be. Some conditions can be corrected, and some eye diseases can be detected and treated in early stages. Kids need eye exams too! Although less than 15% of preschool children get an eye exam and less than 22% receive vision screenings, children’s eyes should be checked regularly by an eye doctor or pediatrician. Vision Health: Fact or Fiction? FICTION! Your eyes will not grow weaker as a result of using corrective lenses. Your prescription may change over time due to aging, but it is not because of your current prescription. FACT! Looking straight at the sun may not only cause a headache or distort your vision temporarily, but it can also cause permanent damage to your retina — the back of your eye. The most dangerous times for looking at the sun are midday or during a solar eclipse. FICTION! At the first sign of symptoms, such as blurred vision, eye pain, flashes of light, or sudden onset of floaters in your vision, you should see your doctor. If detected early, you may be able to correct, stop, or slow down the loss of vision. Information on vision health in Jefferson, Lewis and St. Lawrence counties is somewhat limited. 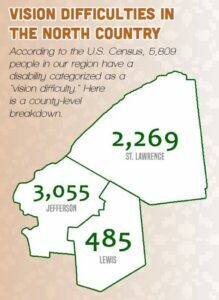 However, the data available shows that many in the North Country region have some form of visual impairment. According to the U.S. Census American Community Survey, more than 5,800 people (2.4%) in our region have a disability categorized as a “vision difficulty.” Rates are higher among older adults — at least 7.2% of those aged 65 and older have a vision difficulty disability. 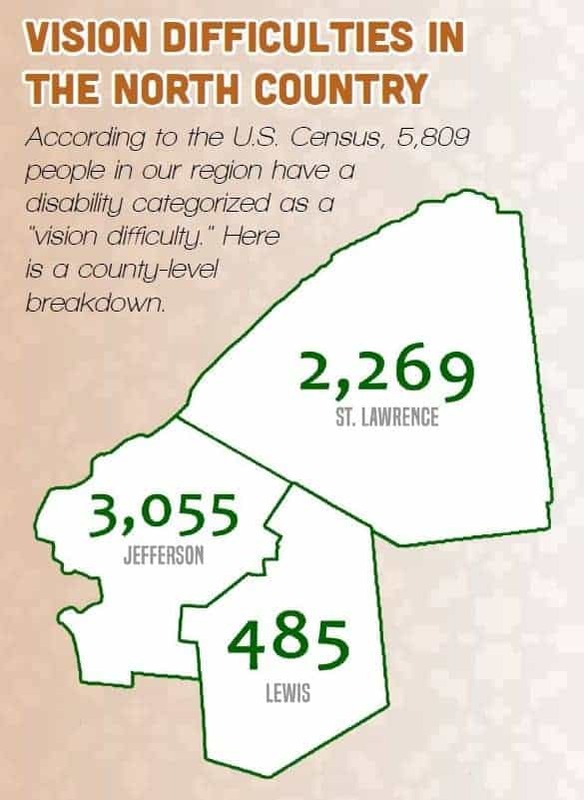 At the county level, 3,055 Jefferson County residents experience vision difficulties, as do 2,269 people living in St. Lawrence County and 485 in Lewis County. • Have a comprehensive dilated eye exam. 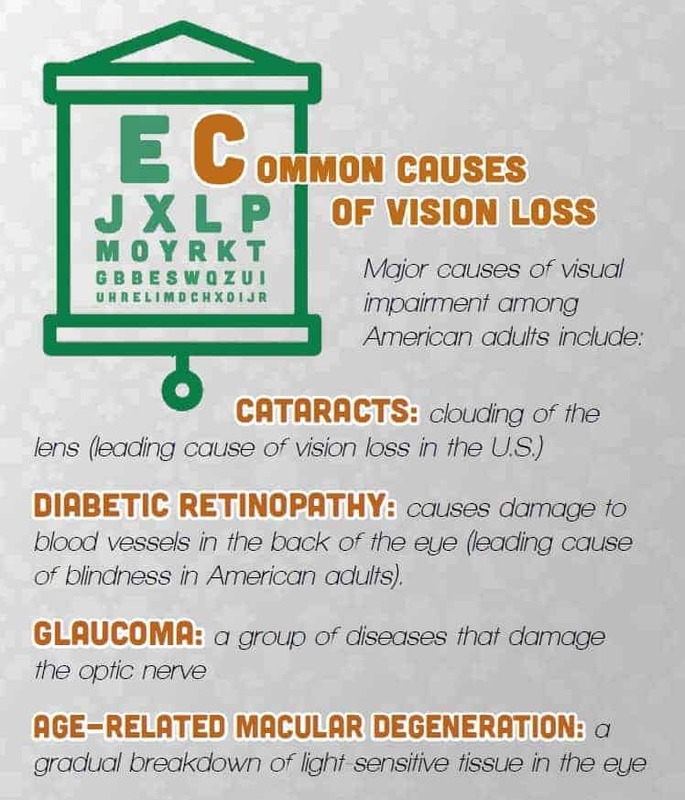 Many common eye diseases have no warning signs. A dilated eye exam is the only way to detect them in early stages. • Know your family’s eye health history to help predict your risk for vision loss. • Eat right to protect your sight. Fruits and vegetables, particular dark leafy greens like spinach or kale, can help keep your eyes healthy. • Maintain a healthy weight. Being overweight or obese increases your risk of developing diabetes and other conditions, which can lead to vision loss. • Wear sunglasses that block out UV-A & UV-B radiation, and protective eye wear for sports or recreational activities. • Quit smoking or never start. Smoking is linked to several visual impairments that can eventually cause blindness. • Give your eyes a rest. If you spend lots of time at a computer or focused on one thing, you blink less often and your eyes get fatigued. Try the 20-20-20 rule: every 20 minutes, look away about 20 feet in front of you for 20 seconds. • If you have any of the following eye problems, visit your eye doctor as soon as possible — decreased vision, draining or redness of the eye, eye pain, double vision, diabetes, floaters (tiny specks that appear to float before your eyes), or flashes of light. • Promote eye screenings and provide education. The National Eye Health Education Program is a great resource for communities to use. • Promote and practice workplace eye safety. • Provide mobile screening clinics — one resource is the New York Center for Agricultural Medicine and Health (NYCAMH) Occupational Mobile Clinic. • Screen higher risk groups, such as women, minorities and those who have diabetes or who are at risk for diabetes. The National Commission on Prevention Priorities has identified vision screening among adults aged 65 and older as one of the top 10 priorities among effective clinical preventive services.